HeyPlantMan! Exotic Tropical Plants from St. Pete FL: Green Thumb Festival - Getting Ready ! Green Thumb Festival - Getting Ready ! Getting ready for Green Thumb Festival happening this weekend in St. Pete ! It takes a village ! Green Thumb Festival, here in St. Pete this weekend, is not just another plant show for us, it’s the celebration of the end of a very long plant selling season that started way back at the beginning of last October, 2013, and culminates in a show that not only offers us the opportunity to strut our stuff, but gives us an opportunity to come together, friends and family. 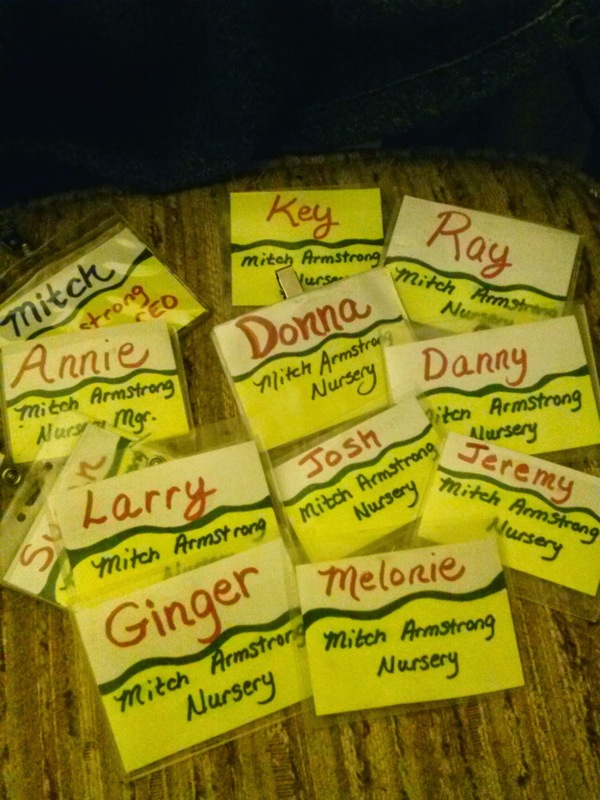 The name tags you see here are not just paper, they are our Peeps, they not only come together to help us, but they are people who are entwined with us, they are truly, our village. Green Thumb is a big Big show for us, we have a Big space, we pay Big money to be there and we are, there, for our customers, the ones that keep us going, so we think Big, we have Big numbers of plants, and it gives us Big joy to be able to do it ! So, we gather great friends & family, that have worked with us all or just some of our season, who know our plants inside and out. We have strong arms to schlep those plants in and out of our booth, we have friends that will tag and hold your treasured purchases, we have friends that make your purchases quick & secure. We have friends, that hey, just want to help us for the heck of it, because they love plants and want to be a part of a great happening. So, we hope you join us, come visit us....we look forward to hugging old friends, and making new ones. We hope we will have great plants that will enliven your gardens and bring you joy. We do this all for you, you are our audience, you are our focus, you are what we work so hard for, so please come celebrate, have some fun, bring your carts, we are getting ready, as Ed Sullivan used to say, for the Big Sheowww ! !